One of the most welcome surprises of 2018, Can You Ever Forgive Me, currently in the middle of a theatrical release in British cinemas, is an amazing true-story inspired film based on the life of writer Lee Israel, who turns to signature forging to make a living when she cannot keep up with the current industry trends after her personality has made her an outcast to the point where her own agent is ignoring her calls. Along the way she enlists the help of the charismatic Jack Hock to make a profit, and what follows is an entertaining, low-key but infinitely likeable period drama, that echoes the Coen Brothers with its wit and charm. Melissa McCarthy and Richard E. Grant are the standouts here and the cast more than deliver. Both their characters are well defined and the emotional heartbeat at the films' core, and for someone as unlikable as Lee Israel is shown to be from the beginning, it's a credit to McCarthy's brilliance as an actress that she's able to make the audience sympathise with her character. Director Marielle Heller can get the best out of the two cast members - who have brilliant chemistry together, and shine every time they share the screen. McCarthy justifiably deserves more awards recognition, whilst Richard E. Grant is at least a worthy inclusion for best supporting actor and when stacked against his competition, deserves that win. The film is brilliantly paced, never feeling too long or too dry. It sets up its act structure nicely and follows it, with a rewarding payoff seeing a but welcome surprise appearance from Brooklyn Nine-Nine and The Good Place's Marc Evan Jackson as Israel's lawyer. Jackson is good, making the most out of his minor role, but all the praise should be on McCarthy and Grant. Their quirks and mannerisms that they help bring to their characters make them feel right at home in the version of New York that Heller is able to bring to the screen, portraying the atmosphere of the seedy bars that they inhabit with a great sense of location. The choice of music is spot on too - from Roxy Music's Same Old Scene being played at the beginning, Can You Ever Forgive Me is the example of how to get the tone of a film just right. Following on from 2015's The Diary of a Teenage Girl, Heller is confident and collective in this well-executed sophomore effort. McCarthy's career-best performance ensures that every dialogue from Jeff Whitty & Nicole Holofcener's smart, punctuated script lands - and by the end you'll be too swept up by how good the film is so that you won't be bothered by the fact that the trailer gave everything away, which unfortunately is an all-too common habit from biopics like this. 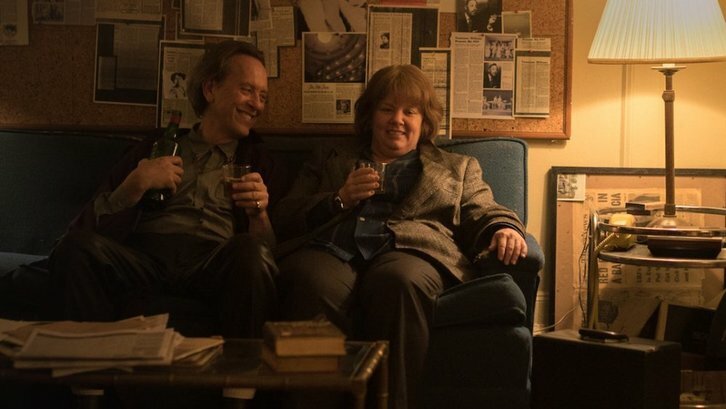 Like the best biopics, Can You Ever Forgive Me will leave audiences wanting to find out more about its subject matter afterwards. If you have a Mubi subscription then it is currently free to watch as part of Mubi Go for this week at participating cinemas (until this Friday, where it is replaced by If Beale Street Could Talk) if there's a cinema near you that's showing it as part of their event - and is every bit worth seeking out if you can. It's one of the most charming films of the year.